On this occasion we will discuss trading strategies, namely the way of candlestick analysis for binary options trading and forex. Candlestick patterns are basically grouped into four, namely reversal patterns, continuation, consolidation and post consolidation. What we will discuss this time is the candlestick pattern which has the highest accurate level. Candlesticks have hundreds of patterns consisting of one candlestick to more than five candlesticks that form a pattern. Candlesticks have an alert level in the form of "signal" and "confirmation". The level of "signal" means that the candlestick has formed a pattern that will show a move up or down, but traders have not been advised to place a position first. The "confirmation" level means that the candlestick pattern has suggested that traders place a position following the direction of the movement in accordance with the pattern that appears. All candlestick patterns have these "signal" and "confirmation" levels. But specifically for the 6 candlestick patterns that we will study, the "signal" and "confirmation" are only limited to suggestions and can be ignored. That is, when the 6 patterns appear, traders can feel calm to put up positions without having to wait for confirmation "again. Every candlestick pattern has a pair that shows the opposite direction. Like the example in the Bullish Engulfing which informs the price movement will rise, and Bearish Engulfing which informs the price movement will decline. The candlestick pattern we will learn is the candlestick with the ideal and best pattern. There is little tolerance in its use and does not have to be 100% the same in the conditions in this article. It's just that, the fewer differences that exist in practice, of course the more valid and the more accurate the signal from the candlestick pattern. In the form of a candlestick pattern, engulfing means the latest candlestick "hugging" the previous candlestick. In Bullish Engulfing, the body candlestick 1 is between the body candlestick 2 (the shadow that appears in candlestick 1 does not need to be seen). That's why the term "hugging" appears. It is better to occur at the bottom of the downtrend. It is recommended to wait for confirmation even if you don't have to. 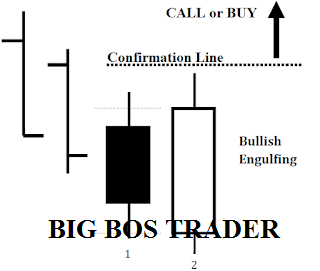 Place a CALL or BUY position if the price moves past the confirmation line. In the form of a candlestick pattern, the Piercing Line means the latest candlestick "pierces" the previous candlestick. In this pattern, it is as if the candlestick 2 "pierced" candlestick 1. 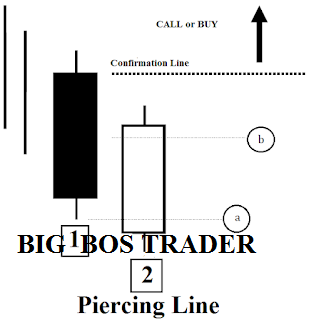 Close candlestick 2 passes at least half of the body candlestick 1 (above line b) but below the close of the candlestick 1 (below the confirmation line). Confirmation not needed is only recommended. 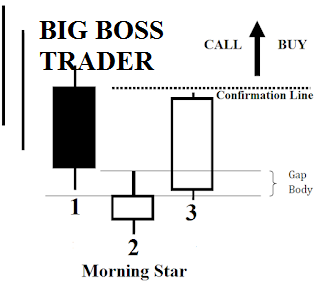 In fact, this pattern consists of two patterns, namely Morning Star and Morning Doji Star. But because of the resemblance, I put this pattern together. Morning (Doji) Star is like forming a "small star" that appears after a dark night (black / bearish candlestick) and then "small star" that makes the atmosphere bright (white / bullish candlestick). Especially for Morning Doji Star, candlestick 2 must be in the form of any doji. 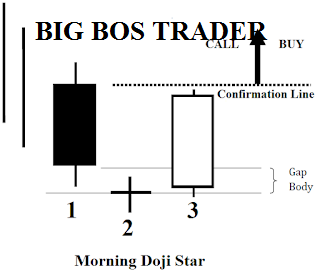 There is no other striking difference that distinguishes Morning Star from the Morning Doji Star. 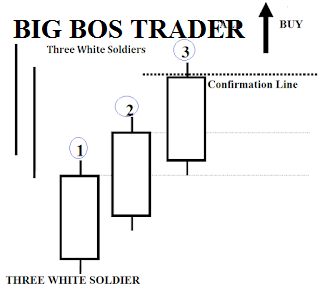 Three White Soldiers means three white / bullish candlesticks appear. This pattern is a pattern that shows a very bullish trend movement condition. This pattern resembles a guardrail or a small black body bearish candlestick accompaniment that is escorted by white body bullish candlesticks on the right and left. This pattern shows a very bullish price movement. the most important of candlestick analysis is the position of the candlestick pattern. "Position means the location of the emergence of the candlestick pattern. The location can be on the bottom or the top. Determination of bottom and top is quite subjective. In this article, except for Three White Soldiers and Rising Three Methods, all candlestick patterns are bullish reversal pattern. This pattern is a pattern that shows an upward movement after a downward movement has occurred (because it is called a reversal or reversal). 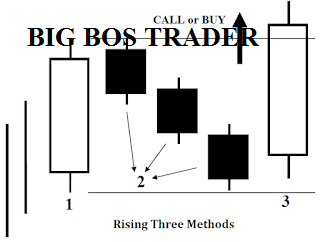 While the Three White Soldiers and Rising Three Methods are classified as bullish continuation patterns. This pattern is a pattern of upward movement after the previous upward movement pattern has stopped. 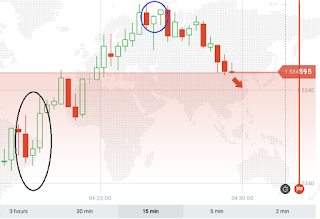 Therefore, in using it for transactions, pay attention to the position of the candlestick pattern and see the movement of the previous movement before making your transaction decision. Regarding up and down movements, in terms of technical analysis is called a trend. 0 Response to "7 Most Accurate and Profitable Candlestick Patterns for Binary Options and Forex Trading"